Rivoli EyeZone Stores get a new Face. To make the cooperation with Zeiss visible, the 12 Shops, some of them are new and some are existing ones, get wrapped in an extraordinary design robe. 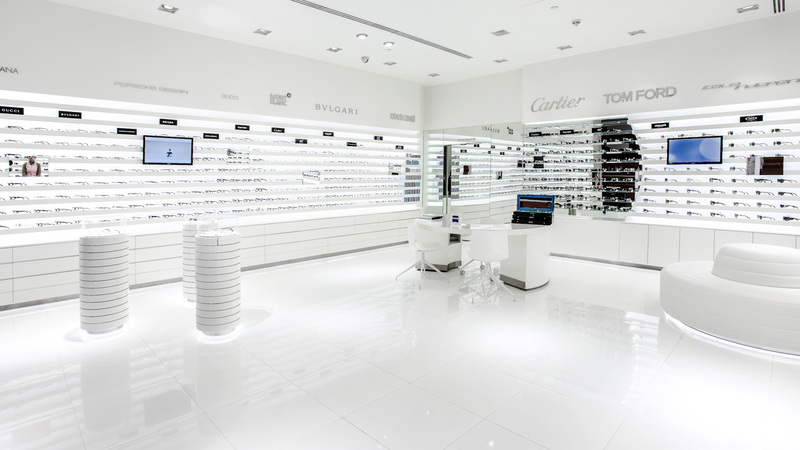 Based on the Zeiss Shopsystem Design the architecture was adapted to the market in Dubai, Abu Dhabi and Katar and also to the spezial needs of the EyeZone Chain. Inside this exclusive and luxury Shopping Malls it is essential to show a destinctive identity. The first impression counts. The developed Design Concept gives every store an uniformity in form and atmosphere, but every location shows his own spirit. Every store has to be unique. 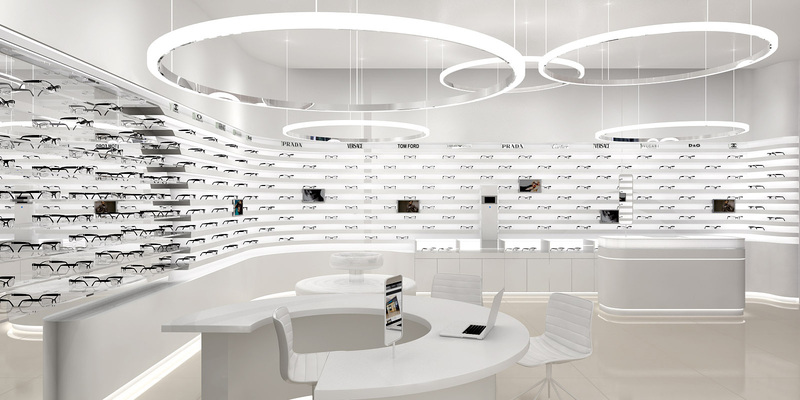 The new shop design illustrates the first-class frame collection, the high quality of eye measurement and consutling services combined with the precision of the Zeiss Lenses. 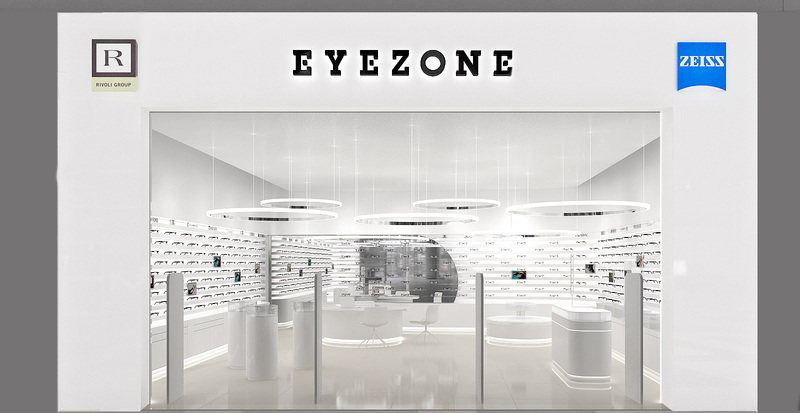 On one side every EyeZone Store should have his own and unmistakable Code, and on the other side the stores should be recognized as part of Retail Chain. The monochrome pure white and straight architecture stick out of the excess supply of the Retail Worlds in the arabian Malls. The special shelve design forms unexpected rooms. The floating shelve system becomes the global and consitent design principle of the EyeZone Stores. Through the very open shopfront the whole interior transformes to a large and extroverted showcase, which animates the passersby to enter. Assorted flatscreens, cosy lounges, reflected designer lamps, shiny brand logos and special designed measurement rooms stages an additional purchase experience. 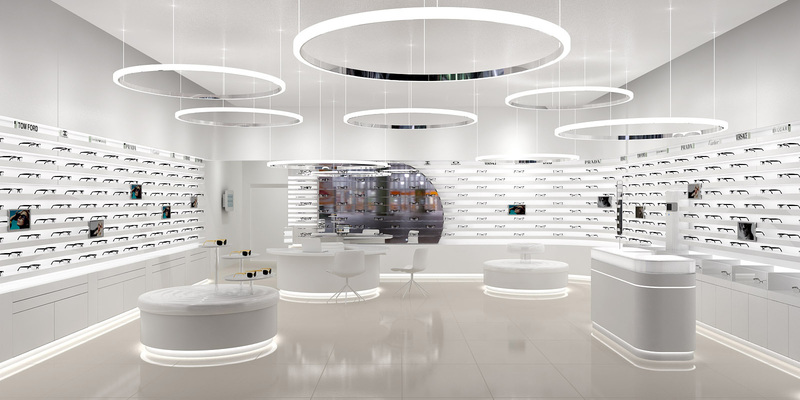 Beside the frame and lens competence, the new extroverted Shopdesign makes the Rivoli / Zeiss EyeZone Stores to the prime address of purchasing glasses in the United Arab Emirates.